Move over take-out. 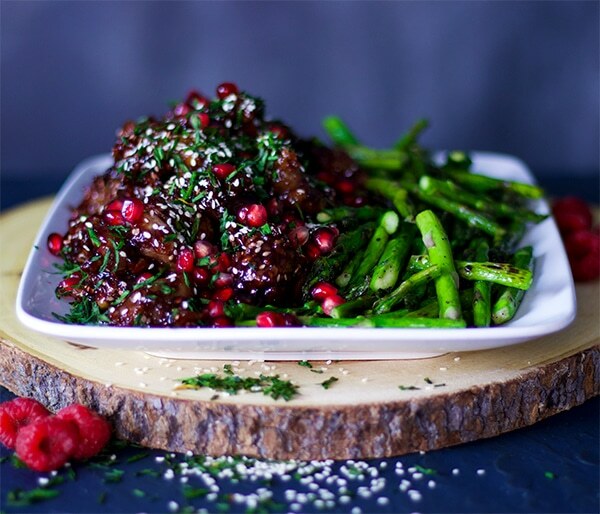 Crispy fried pieces of chicken or pork coated in a sweet, tangy, nutty pomegranate raspberry sesame sauce for a unique take on sesame chicken that just might replace your normal take-out routine. My friend, this version of sesame chicken is ridiculously good. And yes, it requires a lot more time in the kitchen than opening take-out boxes, but once you taste it, I feel strongly that you’ll consider every minute spent cooking this dish time well spent. Marinating chicken in buttermilk and salt (or soy sauce) makes incredibly moist, tender and flavorful chicken. The longer you can leave the chicken in the marinade the better – 24 hours is idea. Pomegranate syrup is one of my favorite things on the planet. Making it requires only the patience to let pomegranate juice and a bit of brown sugar reduce down to a thick, rich, syrup. After that, there’s no limit to what you can do with it. Drizzle it over sautéed veggies, grilled steak, or pan seared chicken. 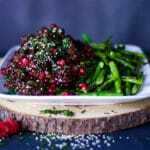 Toss kale, fresh veggies, almonds, and pomegranate seeds in a drizzle of pomegranate syrup for a deliciously elegant salad. In this dish, it elevates sesame chicken sauce to a whole new level of good. I kinda feel like the words “crispy fried” in front of most foods send a strong that it’s probably going to be good. The reason this recipe suggests chicken OR pork is because I’ve made it with both and can tell you with absolute certainty that both are fabulous. 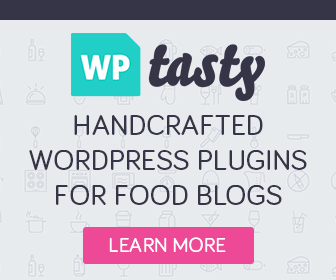 The reason this recipe doesn’t suggest steak or shrimp is simply because I haven’t tried those yet. If you come back to this recipe at some later date, and see the suggestion of using chicken OR pork OR steak OR shrimp, you’ll know I tried it and loved it. 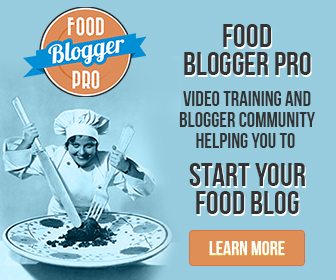 If you beat me to it and try this recipe with steak or shrimp, please let me know. 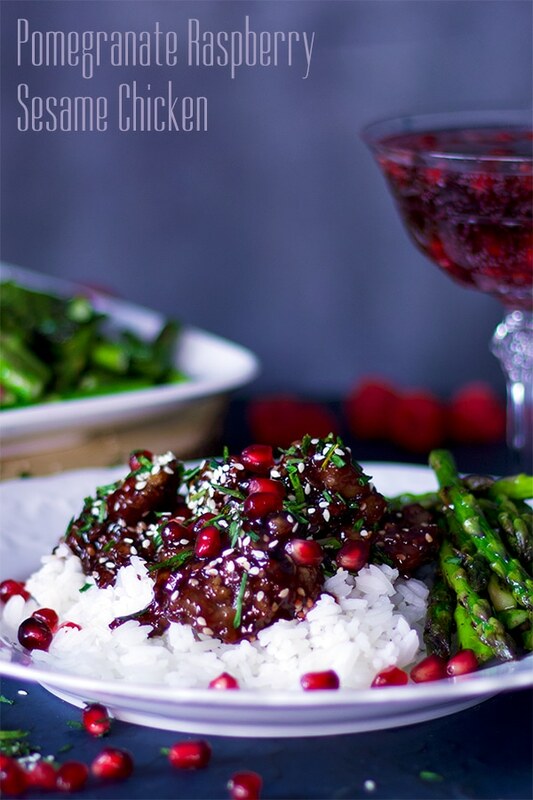 A deliciously unique take on sesame chicken: crispy fried pieces of chicken or pork coated in a sweet, tangy, nutty pomegranate raspberry sesame sauce. Add buttermilk, soy sauce, salt, 1 tablespoon brown sugar, 1 tbsp toasted sesame oil, and 1 tablespoon orange zest. Whisk to combine. Lay the chicken or pork out in an even layer in a rectangle baking dish. Pour the marinade over the meat and stir the pieces around a bit to coat. Cover and refrigerate for at least 1 – 24 hours (the longer the better) . 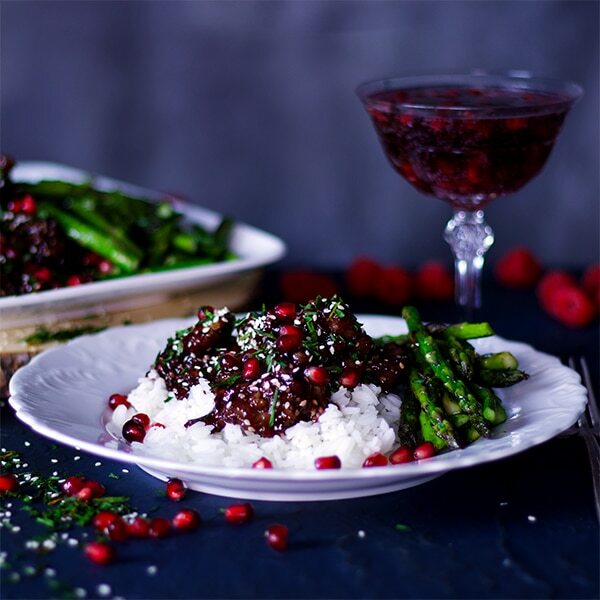 Pour the pomegranate juice into a medium size saucepan, stir in 2 tablespoons brown sugar, and bring to a boil over medium-high heat. When the juice is at a rolling boil, reduce the heat to medium and let cook until reduced to 1 cup, stirring occasionally. This will take about 45 minutes; in the last 15 minutes of cooking, when the juice is turning into a thick syrup, reduce the heat to medium-low, and stir more frequently to prevent burning. Pour the reduction into a measuring cup or small bowl and let cool slightly. In the meantime, add 2 tablespoons cornstarch, raspberries, 1/4 cup orange juice, rice vinegar, 1 tablespoon sesame oil, and 1 tablespoon orange zest to a bowl. Stir to mix, mashing up the raspberries a bit with the back of the spoon as you stir. 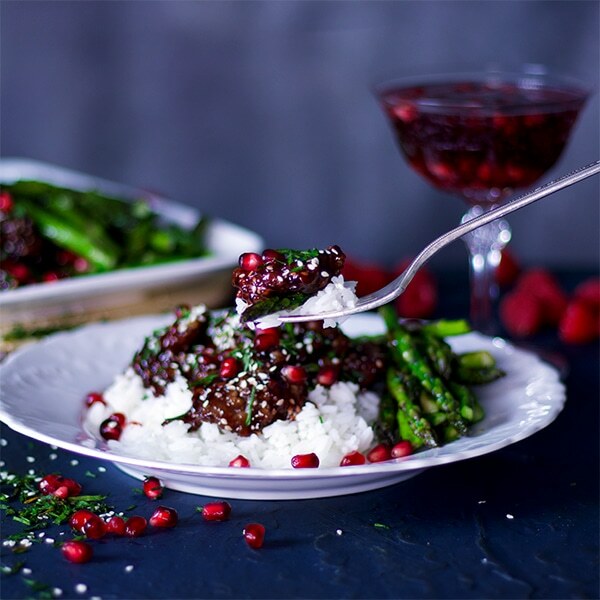 Stir in the pomegranate reduction and set aside while you prepare the chicken. Crack the eggs into a shallow dish or pie plate and add 1 tsp salt, 1/2 tsp ground black pepper, and 2 tablespoons sesame oil. In a separate shallow dish or pie plate, add 1 & 1/2 cups cornstarch, the flour, and 1/2 tsp salt. Stir to mix. Remove the meat from the refrigerator. Add several pieces of meat to the bowl with the eggs. Toss the pieces around to coat in the egg mixture, then place them one at a time in the flour and cornstarch mixture. Press the meat into the cornstarch and flour to form a thick coating. Set breaded meat on a separate plate. Repeat until all the pieces of meat have been breaded. Add 3 inches of vegetable oil to a large heavy bottom saucepan or dutch oven and set it over high heat. Using a deep frying thermometer to monitor the temperature, heat the oil to 360 degrees. Using metal tongs, place 8-10 pieces of meat in the hot oil. Let cook for about 3 minutes, then turn them over in the oil and let them cook for another 2-3 minutes until they are a rich golden brown on all sides. Place the cooked meat on a paper towel lined plate and repeat with the remaining pieces of meat. 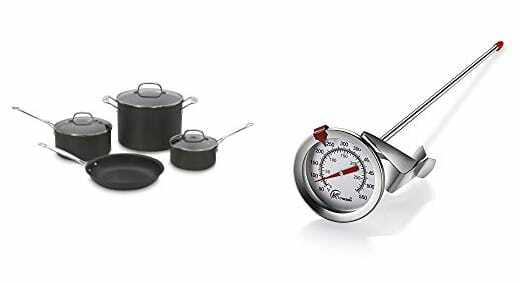 *Try to keep the oil temperature between 350 and 360 degrees at all times. Place the cooked meat on a serving plate and cover with aluminum foil while you finish the sauce. Heat the remaining tablespoon of sesame oil in a large saucepan over medium heat until shimmering. Add garlic, ginger, and crushed red pepper and cook for about 10 seconds, just until the garlic and ginger are beginning to brown. Add the Pomegranate Raspberry Sesame Sauce and cook, stirring constantly, until the sauce thickens and boils. Remove from the heat and stir in 1/4 cup toasted sesame seeds and the cooked chicken or pork. Stir to coat the meat in the sauce. 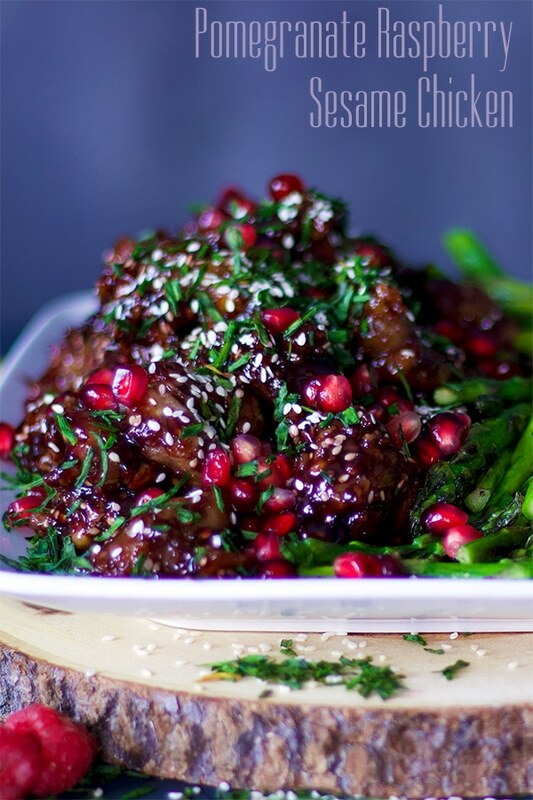 Scoop the chicken or pork onto a serving platter and top with the remaining 1/4 cup sesame seeds, pomegranate seeds, and chives. Serve with Jasmine Rice and Sautéed Asparagus.